After a flood, you are left with a mess to clean up and damage to your home that may take an expert to identify and correct. Besides the visual damage that the mud and water has caused, there may be some electrical, structural, or gas line damage that will take an expert to correct. Don’t face this monumental task by yourself. Contact AHS specialists to help you navigate through this restoration processand get your home back in shape. If you’ve got a burst pipe, you need to act fast to minimize damage. Follow these steps and contact AHS to help you repair the damage. Collect water from the leak – if it’s through the ceiling, collect it in a bucket. If the ceiling bulges, pierce the plaster with a broom handle to let water through. Turn off the stop tap and turn on the taps to drain your water system. Call American Home Specialists to seal pipe. After the leak has been fixed, air the affected areas by keeping doors and windows open; do not overheat affected rooms as this could cause more damage. Leave windows, doors and built-in cupboards open during the day, if possible. So much goes into restoring and Drying Out your home after a flood. Did you know that there’s an actual science behind the restoration? There’s more involved than simply opening doors and windows and removing soaked rugs. The latest innovations center on improving air quality. In fact, today, most technicians use advanced restoration and inspection tools such as an infrared camera to efficiently detect water. This tool has become the scientific standard for monitoring, detecting, and controlling water damage. The restorer’s goal is to get your home back in shape and put your life back together after any water damage. Thanks to the scientific advancements in applied structural drying techniques, this entire process is much more efficient. Be it from a storm, a broken pipe, or a basement leak, AHS knows the ins and outs of water damage and restoration. Don’t trust your home to a less experienced contractor. We are certified to restore your home and back our work with a guarantee. Contact us for more information on Water Damage Restoration. Water damage is one of the most common reasons people make claims on their home insurance. 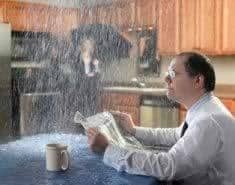 Burst pipes, leaky appliances and flooded basements often lead people to discover the details of their home insurance policies. Although insurance companies may pay to replace a carpet damaged by your dishwasher leak, you’ll probably have to replace or repair the damaged hose at your own cost. If a sudden, unforeseen problem such as a frozen pipe leads to water damage, your home insurance covers repairs to both the broken pipe and your home and furnishings. Here are common water-damage scenarios and their insurance consequences. Scenario No. 1: The temperature drops to 10 below zero, causing your water pipes to freeze and burst. Your floor is now covered in 6 inches of water. Are you covered? Yes, you’re covered for water damage from burst pipes, but most policies won’t cover you if you’ve left the house unoccupied and without heat. If that’s the case, your claim could be denied because you’ve failed to perform the necessary upkeep that would prevent the accident. Are you covered? The damage to your basement and your personal property are covered, but not the damage to your lawn. According to a sample policy, “We do not cover land, including land on which the dwelling is located.” However, your lawn is covered if it’s damaged by certain “named perils.” These include fire, explosion, riot, aircraft, vehicles not owned by you and vandalism. The amount of coverage for lawns and plants is small — usually only up to $500. Swimming-pool leaks are not a named peril. But if your leak was caused by a tree falling on the pool, it would be covered. Are you covered? Yes. But it depends on your home insurance company’s view of the problem: Did you fail to maintain the washer properly or did sudden, accidental damage cause the flood? Usually, water from a broken appliance will be covered. Scenario No. 4: A sewer backs up, flooding your basement. Are you covered? No. Standard home insurance policies don’t cover sewer backups, and many specifically exclude damage from sewer back-ups. Special endorsements are available, at added cost, for sewers and drains. Are you covered? No. Seepage is considered a maintenance problem, not “sudden and accidental” damage, and is excluded from home insurance coverage. Are you covered? Somewhat. You’re unlikely to be reimbursed for roof repairs because that’s a house-maintenance issue. But the water damage to your home is covered. Damage to your furniture is also likely covered if you have a standard H0-3 home insurance policy, but not if you have a generic HO-1 policy (which many insurers don’t even sell anymore).